Each washing cycle, 10 to 20 million microplastics are released into the surface waters through our washingmachines. The result is many ill and dying animals, a damaged ecosystem and plastic particles in our food and drinks. We can prevent this from happening with a microplastics-filter for washing machines. On average synthetic clothes, particularly fleeces, release 20 million fibers during every washing cycle. Synthetic fibers end up in the surface waters of the world where they remain forever. They are often ingested by animals. The tiniest synthetic fibers can enter the tissue and organs of fish and shellfish and may eventually end up on your plate and in your body. We can prevent synthetic fibers from entering the water with a microplastics-filter. Together with a number of partners from the business community, within the government and the scientific world, MarcelvangalenDesign is working on the development of a IoT Microplastics-filter for washingmachines. Until now this project has been financed by MarcelvangalenDesign with some help of the Government. This Research & Development cooperation has finished. Now we are looking for partners to further develop this product. Our partners can help us by donating their knowledge, their network and a financial contribution to cover the costs of the basic research activities. Microplastics filters are able to filter 90% of the microfibres. We added a unique IoT solution. This way, users can be compensated for the costs they are making: using a microplasticsfilter can lead to reduced taxes. 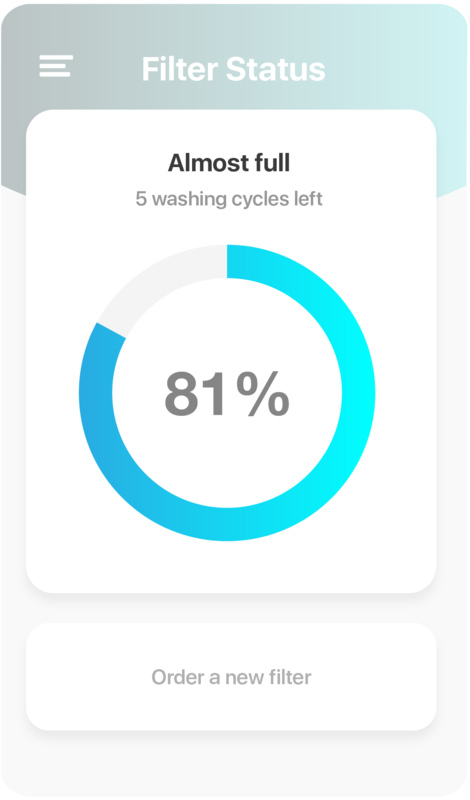 The app enables users to check on the state of the filter and make data available to Water Boards and organisations who take care of the periodic replacement of the filter. You can become a sponsor for € 15.000,-. Do you want to become a sponsor? Send us a message and we will contact you shortly! Every little bit counts! Ofcourse we appreciate donations. Donors get the opportunity to be the first to purchase a filter with a discount.